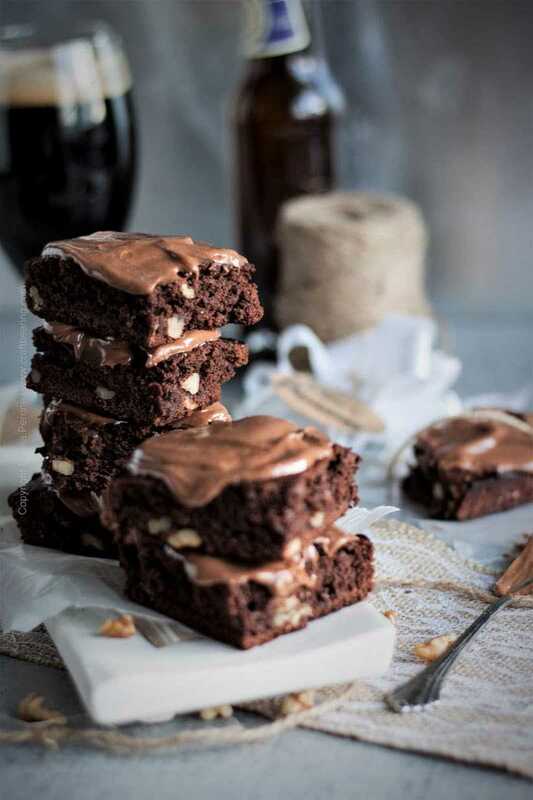 Beer brownies are one of the most popular sweet treats baked with beer. They are typically flavored by a stout or a porter for their characteristic chocolate and/or dark roasted coffee flavors. Since today is National Brownies Day I made us a large, delicious batch of stout brownies with walnuts and chocolate cream cheese frosting. Making beer brownies is very much like making regular brownies with the exception of getting the beer ready to join the batter. The first thing you will need to do is to warm up butter and the beer of your choice in a saucepan until the butter melts and they are well blended together. After that the process simply entails mixing dry and wet ingredients together. As a rule of thumb – when baking beer brownies go for well balanced stouts or porters. Stout (unless it is pronouncedly coconut, cherry or otherwise flavored) generally imparts a coffee like or dark chocolate flavor. Porters (unless deliberately brewed with roasted barley) lend more mellow chocolaty flavors. I opted for a well balanced, middle of the road (as Chris sometimes likes to say) ale – Breckenridge Oatmeal Stout. It is smooth, medium bodied from the flaked oats added to the grain bill with both semi-sweet chocolate and dark-roasted coffee aromas and flavors, neither one overpowering, and the IBU is low at 36. Check out this post for Stout Brownie Mix DIY Gift to see it. I love to add walnuts to any brownies mostly because of the mildly bitter notes they bring about. I find that they partner very well with the flavor contributions of the stout. But feel free to completely leave the walnuts out or substitute them with almonds or other nuts. As to the frosting – it is optional. I don’t make brownies very often and we never really buy them, so I felt like going all out and whipped up a quick chocolate and cream cheese frosting. Don’t worry about it causing the brownies to stick together when stacked:) You absolutely do not need to pile up your brownies high like mine in the pictures. I did it just for show. Finally, if you were to shave a bit of good dark chocolate over the frosted brownies… I am pretty sure no one will blame you and many might salute you. Just a thought. Cakey or fudgy beer brownies? Below is the base recipe I used to bake the brownies you see in the pictures. It yields 20 squares if you use a 9×13 inch cake pan (why bake brownies if you are only going to end up with a dozen, right?). This base recipe results in brownies with a texture that leans heavily on the cakey side. If you prefer fudgier brownies you can use the same recipe with small modifications. All you have to do is increase the fat-to-flour ratio in order to achieve a higher fat content in your batter. You can easily do this by using 1/4 cup less flour than noted and melt an additional 1/2 stick butter. Also, completely leave the baking powder out of the flour and let the stout be the only leavening agent. This will also help change the texture to fudgy. Want to give stout brownies as a gift? I put together this post on mixing a stout brownie mix to give as a gift along with a stout. It is one of the most visited pages on our blog -possibly because it looks incredibly appealing in its simplicity. All the recipient has to do is add butter and eggs and they can bake their own beer brownies with the stout you selected for them. TIP: Be sure to decide on the intended texture of the beer brownies before mixing the dry ingredients and writing out the instructions. For cakey brownies, use the recipe as given, for fudgy brownies make and note the recommended adjustments. 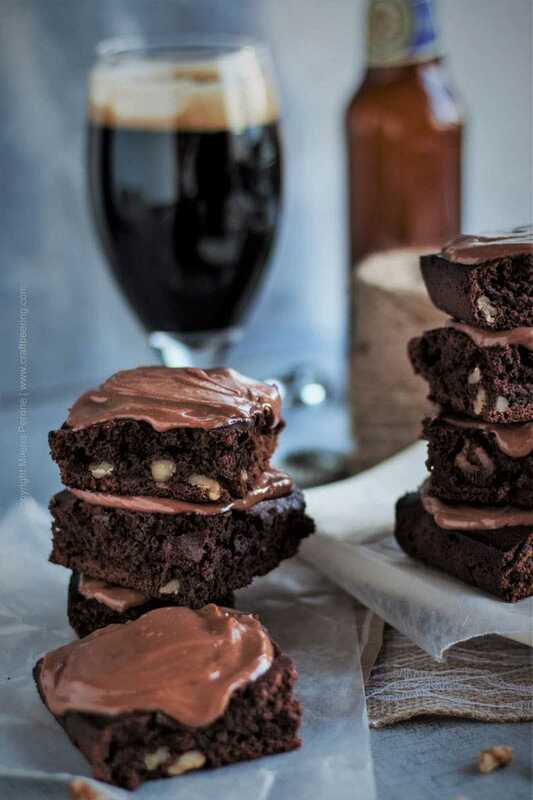 Beer brownies with stout and its tempting 'dark chocolate' flavor notes. Walnuts and chocolate cream cheese frosting optional, but strongly recommended. Cakey or fudgy texture is up to you. Line a 9x13 inch cake pan with parchment paper. Grease the paper well with cooking oil or melted butter. Mix all the dry ingredients together (walnuts too). Set aside. In a sauce pan melt the butter, then slowly add the beer to warm it up. Stir occasionally. Do not bring the butter and stout mixture to simmer, it just needs to be warm. Set mixture aside. Beat the eggs and add them to the dry ingredients. Stir in by hand. Add the butter stout mixture and the vanilla and stir until all ingredients are well incorporated (do not over mix). Transfer to cake pan and bake for 30 min. Let cool off completely before cutting into squares. While beer brownies are cooling off, mix the frosting. Melt the chocolate chips in a double boiler or in the microwave at 30 second intervals. Add to the cream cheese and confectioners sugar and whip until well incorporated. Apply over cooled off brownies. Nutritional information is based on the ingredient quantities for the cakey version, including the walnuts and cream cheese frosting. I cannot wait to make these for my SIL whose family owns a large craft brewery in Utica! Fun! Thank you for stopping by, Bonnie! I made these brownies last night and just brought them to the bar where I work (last day for one of the waitresses). You’re gonna have a lot of new followers! Great recipe. Should have baked a double batch. Wow, these brownies look amazing. Have you ever considered writing a series of post on photography? Your photographs are art. So beautifully done. Wonderful photos, by the time I got to the end of the post I was so hungry for your brownies. Shared on Pinterest. Thanks for bringing your recipe here. Yumyumyumyumyum. Thanks so much for sharing at the #happynowlinkup! 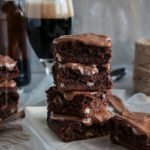 Brownies with beer are my absolute favorite and I love how you’ve given instructions on how to make cakey AND fudgy brownies with the same base recipe! I’d totally go fudgy ? Well these certainly look yummy! Thanks for sharing the at the #HomeMattersParty. I’m out and about this morning visiting some of the participants and just had to pop in to see this recipe! Happy Holidays and Merry Christmas from Vintage Mama’s Cottage! These brownies look AMAZING! They look like they were made to perfection! That frosting! Oh man, this is the decadent treat I’ve been needing in my life! My they look yummy and I bet they taste so good. Walnuts and brownies go hand in hand. Now I can add beer to that combo. You should totally do it! Stout works miracles in brownies! I’ve seen them on IG and Wow it’s what I commented! And I’m not even a brownie lover! But I really like the look of these ones, the addition of the stout, the walnuts for an added crunch, the chocolate cream cheese frosting. I’d love to receive them as a gift 🙂 . I just had a salted caramel stout that would have been amazing in this!! Thanks you for sharing at the What’s for Dinner Party! 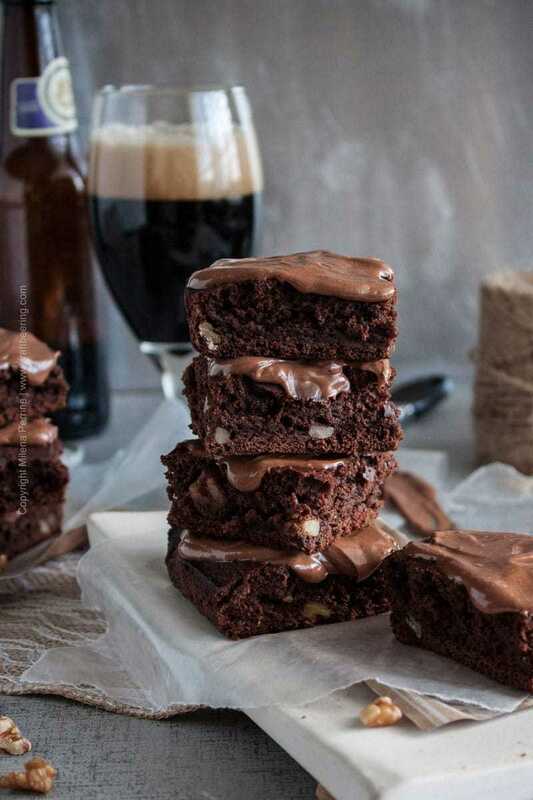 OMG, yes, a caramel stout and the fudgy option of the brownies…Sounds absolutely perfect! Thank you for stopping by, Helen! They have a day for every single thing ha..ha..! But I won’t mind National Brownie Day though. These look sooo moist and decadent!!! I’m drooling. Your pics are gorgeous! 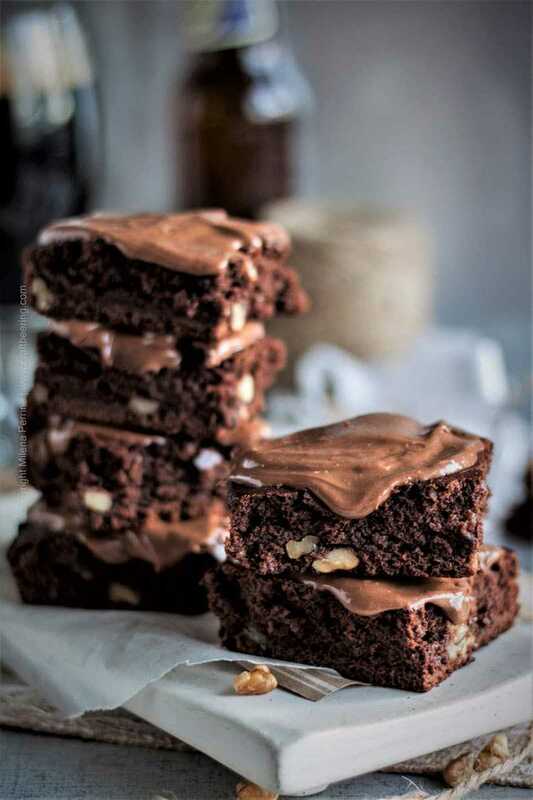 I love that you added walnuts–they’re my favorite addition to brownies because I’m a texture freak :). And the frosting sound ahhhhhmazing too. Yum is all I can say! Have a great weekend!